As various smart home components become more and more generic, manufacturers have started looking for new tricks to distinguish their products from the rest of the crowd. Here’s one idea: Take a key feature from another product category and incorporate it into your gear. 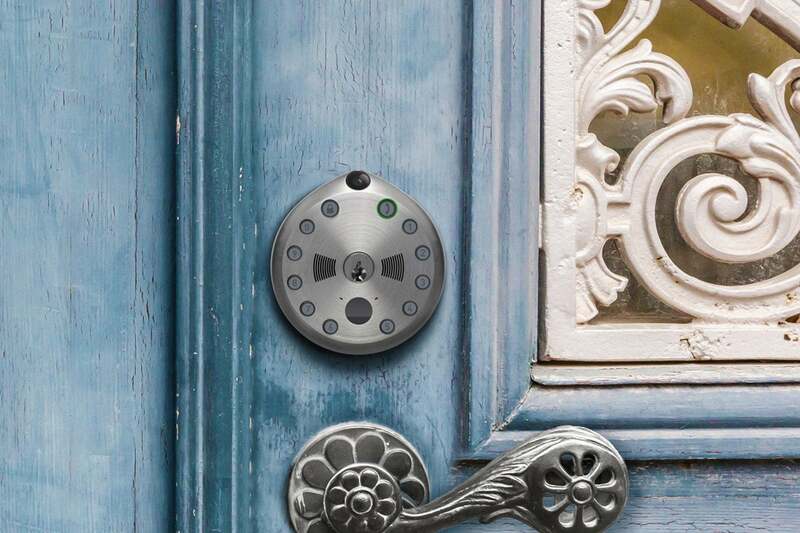 Meet Exhibit A: The Gate Smart Lock, billed as the first smart lock with an embedded camera. You can think of Gate as a mashup of a retrofit smart door lock and a video doorbell. As a smart lock, it supports three means of gaining entry: physical key, four-digit PIN, or smartphone app. But the small camera on the front of the lock also works as a basic surveillance system, using motion detection to alert you when someone approaches your door, and broadcasting live video back to your handset. There’s also a two-way audio feature, so you can speak directly to whomever is standing outside, and then let them in if you so desire. 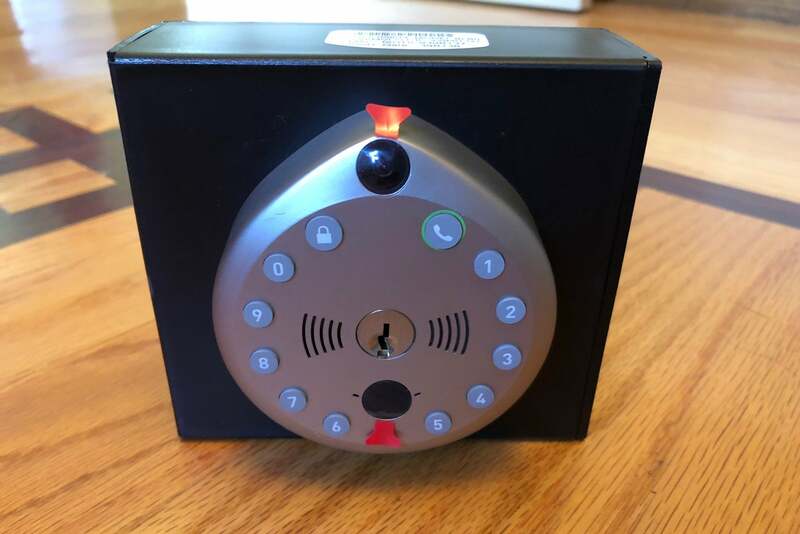 There’s even a doorbell of sorts, as pressing the phone icon on the lock sends a “knock” to the administrator’s phone—though someone who’s unfamiliar with the device will have no idea what the flashing green light does. The Gate Smart Lock bizarrely arrives not in pieces but preinstalled into a block of plastic, making this the first time I’ve ever had to uninstall a piece of equipment before installing it myself. There’s some logic to this, however; the block shows new users how thick their door must be for the lock to work, and it gives you a sense of how the completed pieces go together. If you’ve never installed a lock, this, plus the app that guides you through installation (there is no physical manual), might be a big help. Ultimately, I’ve had more streamlined installation experiences, but Gate goes together easily enough, even though some of the steps are not fully intuitive or perfectly explained. The unboxing experience has the Gate lock pre-installed on a sample block. The Gate lock is powered by an internal, rechargeable battery. To top it up, you pull off the interior portion of the device and plug it into any powered USB connection. (This is essentially the same process as charging up a Ring video doorbell.) Access can be gained or granted via three methods: numeric keypad PIN, physical key, or the mobile app. Naturally, the lattermost of these offers the most flexibility, largely because it integrates with the camera features. When someone approaches the Gate from outside, the integrated motion sensor detects them, flicks on the camera and microphone, and alerts the homeowner via the mobile app. As with the Ring doorbell, you can then activate live video, including two-way audio, so you can not only see who’s standing outside but can communicate with them, too. 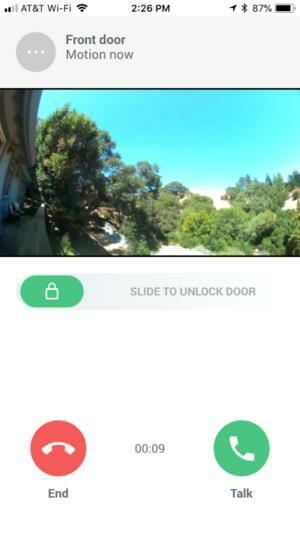 You can pull up a live feed within the app, converse with the person at your door, and unlock the door so they can enter if you like. In my testing, motion detection was good (but not great) when the sensor settled down after a day of use. But even on the most sensitive setting, motion wasn’t registered until the visitor was less than 10 feet away from the door, though this is probably good enough for the typical user. Occasionally, however, I received alerts from the app even when there was no motion at all, and there were times when my app would not connect to the video feed. The audio from the unit was also good most of the time, though I experienced some occasions where it was staticky or significantly delayed. There’s also an audible, fuzzy hum from the external speaker whenever the camera is active, perhaps a feedback issue from the onboard microphone. As a smart lock, the unit is relatively low in frills, though it works well. Administrator users get full, 24/7 access and the ability to monitor video in the app. Guest users can be given time-restricted access and do not receive access to the app at all. The maximum number of each of these types of accounts that you get depends on the type of subscription you purchase. The free basic plan includes real-time video streaming and two-way audio, remote lock/unlock features, up to four admin users, and no guest users. The $5-per-month (or $50-per-year) plan adds the ability to store videos for up to five days and share those videos, plus an unlimited number of admin users and up to 10 guest users. The $8-per-month (or $80-per-year) plan stretches video storage out to 30 days and provides for unlimited users of all types. Regardless of the type of access—keypad, PIN, or app—I found the lock to be responsive and to operate smoothly, without any of the jamming or motor problems I’ve encountered from numerous other units. Basic locking feature expectations, such as automatic door re-locking after a time delay, are also included in the app. 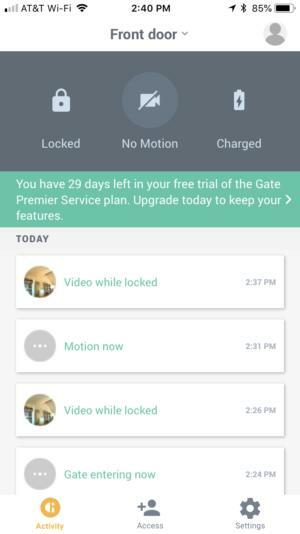 Gate’s app provides a clean history of comings and goings. Considering how nifty the trick of integrating a camera with a lock is, it’s perhaps asking too much for even more from Gate. It can’t, for example unlock the door based on facial recognition, nor does it integrate at all with any other smart home gear. I’d love to swipe my app or scan my face to unlock, then have Gate disable my security system and turn on the lights, but that’s just not in the cards—not yet, anyway. It should also be noted—as the photos will attest—that the Gate Smart Lock is one of the homeliest pieces of consumer electronics I’ve encountered, with the appearance of something salvaged from the Cold War. I wouldn’t put it on my front door—the gateway to my home—in its current state, for fear of offending the neighborhood. It’s also decidedly expensive: At a whopping $349, it’s $70 more than the best-in-class August Smart Lock Pro, and while that sounds like a huge investment, 70 bucks for a battery-powered camera isn’t bad. All told: While it’s a good first attempt, a case redesign and some smart home hooks could really elevate Gate into top pick territory. Watch this space for the inevitable version 2.